I prefer to be a Para-alpinist. A Para-alpinist use’s a parachute as a means of making a controlled descent. Para-alpinist’s use technology to safely navigate from a high point on a mountain to lower ground. This is a truly amazing concept! If the proper precautions are taken, this allows one to quickly and safely get down from a hike or climb. The proper use of a parachute can enable a safe, low impact decent. To make a safe decent there are three things that BASE Jumpers do that a Para-alpinist does not. The first is fly close to objects (Proximity Flying). There is nothing safe about buzzing the ground at high speeds. The second is jumping from locations that don’t allow one to gather distance from the fixed object which is being jumped (Short Rock Drops/ Low Object Jumping). 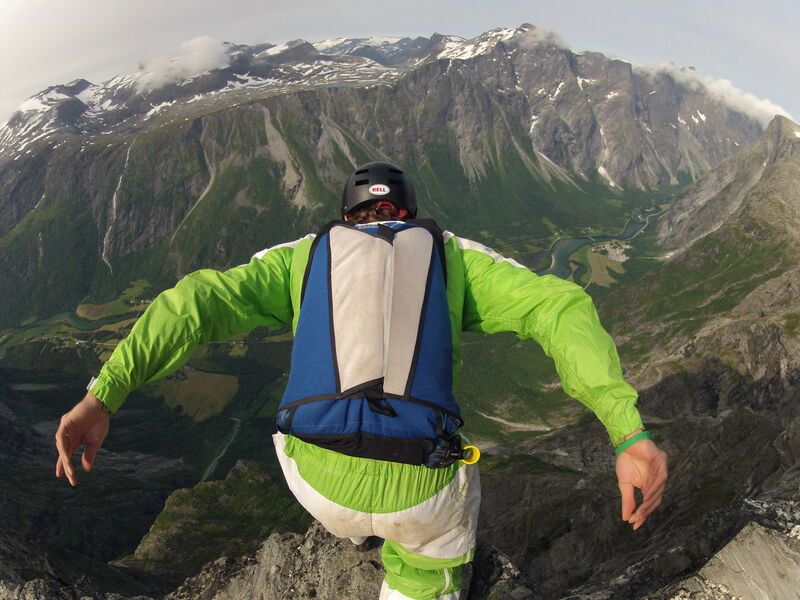 The last is the use of a big wing suit. Big wing suits are reserved for those who have lots of experience, which there are very few in the world. 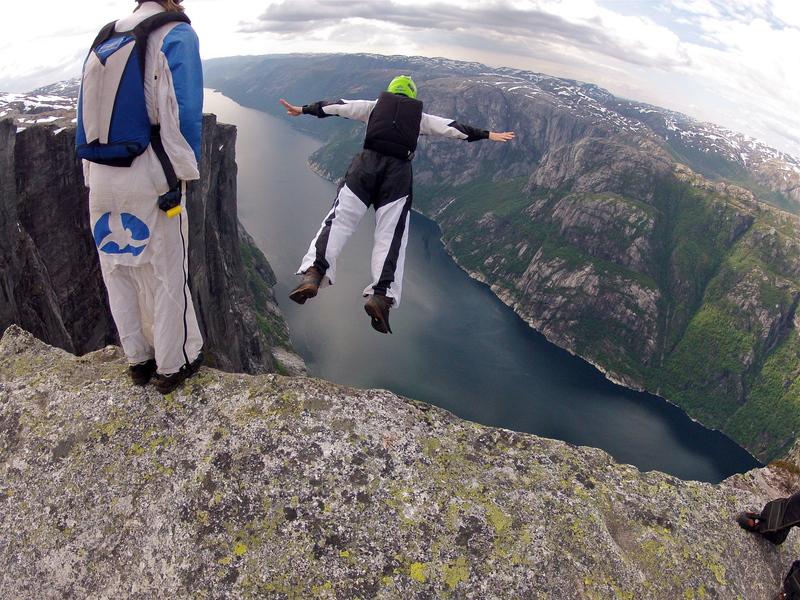 Jumping into a wing suit you don’t have the skill set for is extremely dangerous. In writing this I realize that I have actually been very hypocritical in my learning curve. This season I started jumping with my brother, which made me become extra cautious. I found that he was actually more conservative then me. 🙂 Recently we had a conversation that made me decide to create these guidelines. It’s not cool to be dangerous! Please join me in changing the way we view our passion. Stop encouraging the people we love to be dangerous. 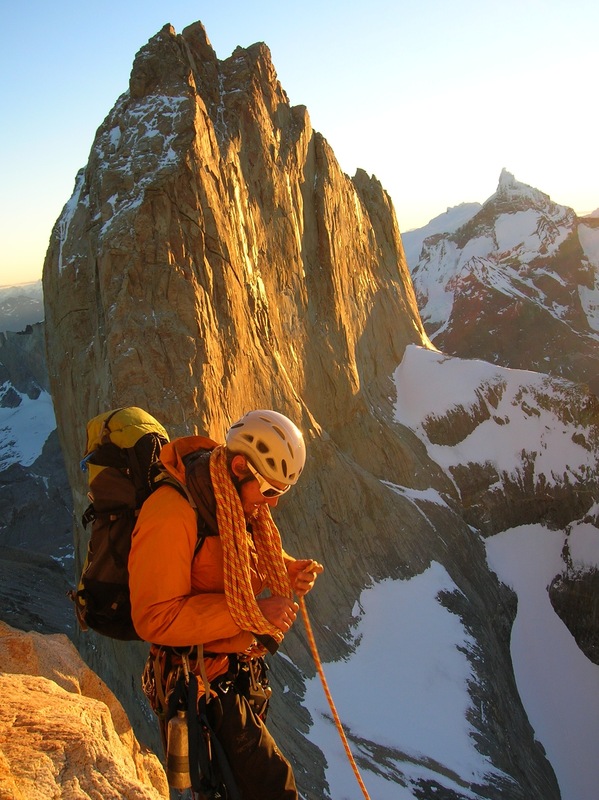 Become a Para-alpinist. Be honest with yourself, love yourself, and stay true to what really maters. For me it is all about having fun in the mountains with the people I love. So I started this summer with the opportunity to be part of a wonderful organization, The Stavanger BASE Klubb. It was a great Heliboogie! Really happy to be a part of it. Everything was super successful. I felt super proud to be part of a team that was extremely effective at organizing the worlds biggest cliff jumping event. Way to go team! I highly suggest that everyone come to this event next year. Its a great way to spend a vacation. After Kjerag it was off to the northern lands, Andalsnes and the Romsdalen valley. Rio was super keen to stay current and the weather was amazing. We were able t get off some great jumps maintaining currency and staying fit. The Jumps here are all very big. You hike most from the bottom to the top earning every bit of altitude on the jump. Its a great place. Full of very friendly people and a group of local jumpers that are extremely experienced and knowledgable. Come here expecting to hike a lot. Show up in shape and ready to go and you will be rewarded with some of the best flights of your life. The beautiful mountains of Norway. Norway is a magical place. A land of trolls and high mountains that have foggy and eery feeling. Its easy to get lost here. I have spent many hours wondering in the mountains looking for signs of a the trail only to find myself back were I had once been. When the fog clears and the mountains expose themselves you find yourself amongst the most beautiful sights to be seen in the world. Europe is leading the world in paralpinism. There attitudes toward human flight are encouraging the development and practice of some of the most incredible feats in the history of human flight and paralpinism. The best flyer’s in the world live in Norway and I had to go see what it was all about. I bought a ticket to Stavanger to meet my friend Eilef. I meet Eilef when I was in Lodi three years ago. He had come over from Norway to take advantage of the cheep jumps The Parachute Center offers. The Parachute Center is the best drop zone to learn to skydive in the world. The jump tickets are cheep, the planes are always running, and you have access to the best skydivers in the world to learn things from. The first stop I wanted to make was at Kjerag. Kjerag is a 3,000ft. cliff with excellent exposure. The Stavanger BASE club has a shuttle system set up for the jumpers that takes you up the mountain and back from the landing area. They are awesome people! Once a year they also permit for helicopters and for four days you can fly up the mountain by helicopter. It was an outrageous place to be. Definitely one of the most beautiful places in the world. Then Lori showed up with Dr. Frankelton (Dr. of Philosophy) the van. “This van is sick dudely.” It was totally decked out with everything we needed to weather the northern mountains. It was such an honor to be on board this vessel. We piled in and headed north to Voss for Extreme Sports Week. We parted for a few days and danced in the rain. Good times. 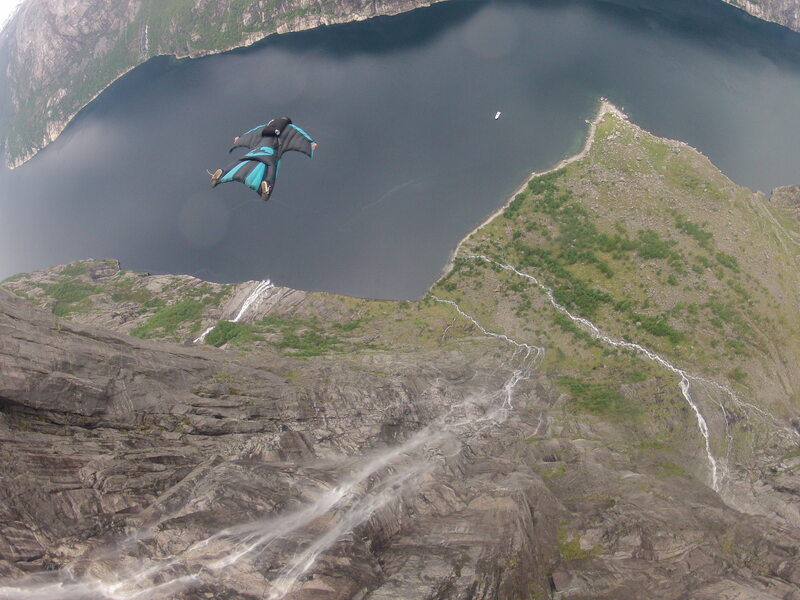 After Extreme Sports Week Dr. Frankelton headed to Stryn. Were all the jumpers launched off this wall above the hotel for a demo. I had quit the experience on one of the jumps here were I ended up pitching out with five line twist and crashing in the gully. Luckily, I was able to clear them just before I landing and got a flare in. Next stop was The World BASE Race in Hellesylt. This place was a dream! A beautiful cliff band set back in a perfect bowl. An object designed for jumping. Last but not least was Rosdolan Valley. This is the location of the classic Troll Wall. I spent three weeks there purifying my practice. The pursuit of human flight (Paralpinism) is illegal in California (Yosemite National Park), so this summer I decided to check out a place were you are free to jump wing suits off mountains in the pursuit of discovering the perimeters of human flight. I jumped on a plan and flew across the world to Stavanger, Norway. 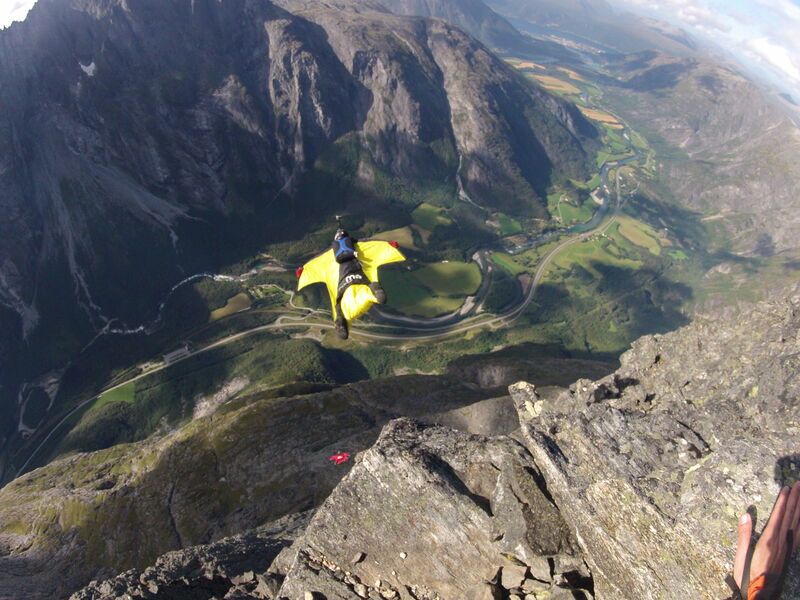 From there I caught a ride with my friend Carlos to Lysebotn were the Kjerag, a 3,000 ft. wall, is located. The day I got there was an amazing day. The weather was perfect, which is rare in this area. The first load left at 9am and before I knew it I was on my way. We hiked for two hours to the top. On the way, I had the pleasure of meet a local Norwegian’s that had been jumping this location since 1996. 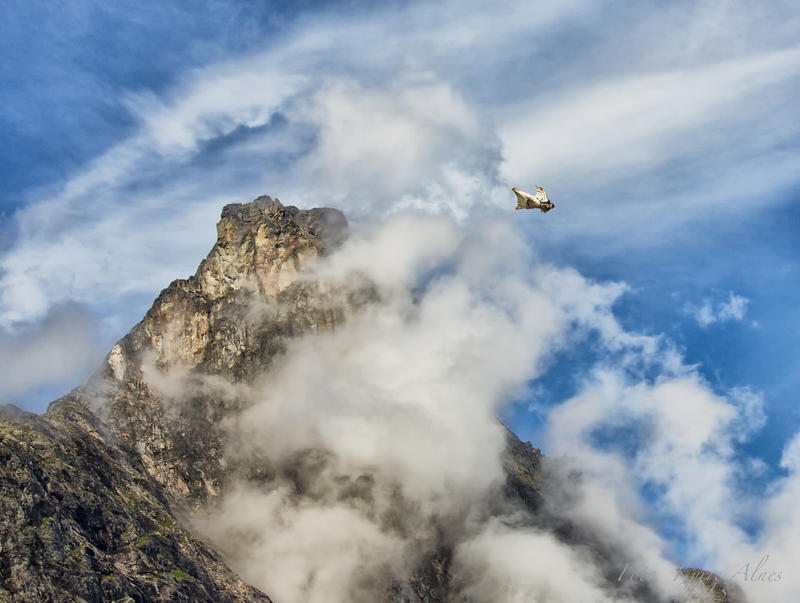 He said the Stavanger BASE Klub had undergone several changes in its years in action and had to develop several rules regarding jumping at Kjerag in order to keep the mountain free for flyer’s. The police and jumpers had worked together to come up with a compromise that both parties could agree on and this was how the SBK had developed. When I reached the exit I was super excited. I could see the landing area bellow me and the idea of jumping in the day light made me feel happy. I was very excited to see the mountain underneath me and as I jumped I could see the beautiful wall pass by with all the crack systems and ledges standing out in the amazing northern sunlight. I deployed my parachute, and upon landing was greeted with a round of applause by all the Norwegians that had jumped before me. 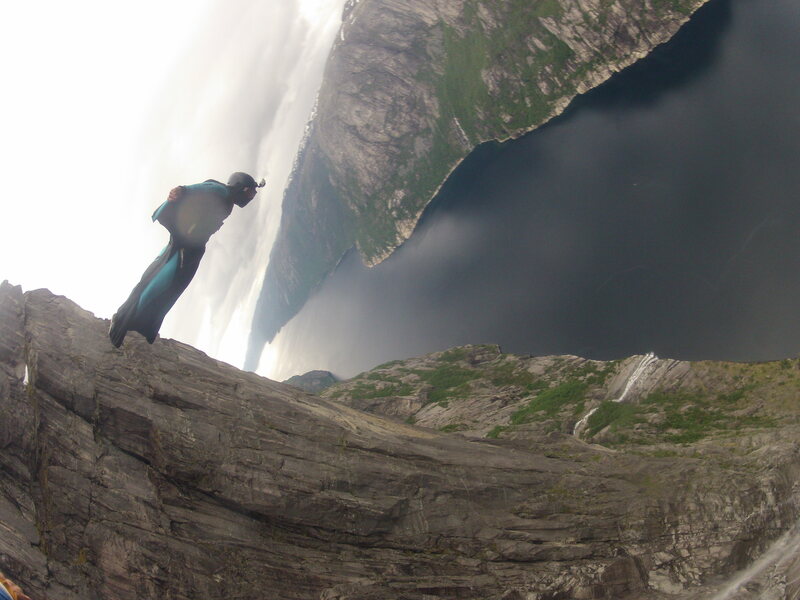 “Congratulations on your first jump in Norway” they said. I was blown away by there kindness and could not stop smiling. My dream of conducting a successful Para-alpinism adventure had been realized. In norway I found a community of people that valued the adventure of life and were excited about a progressive future in Para-alpinism. These people are changing the parameters of what is possible in human flight and making new discoveries every day. The mission of the Human Flight Association is to increase public awareness and establish a user group, share knowledge and inspiration, practice conservation and advancement, and provide logistical support for those in pursuit of human flight. People in the pursuit of human flight struggle in obtaining advancement in there practice. They lack the capacity- financial, personnel, equipment and technology- to establish themselves as a user group. The human flight community is frustrated because we are misunderstood as a result of limited access to knowledge and a lack of public awareness. HFA will act as ambassadors to bridge the gap between the practitioners and the public. HFA is a online organization which provides a platform for open discussion about the pursuit of human flight. Supported through a strong network of practitioners and community-based organizations, HFA is able to spread knowledge and raise public awareness of the pursuit of human flight. – Spread knowledge and raise public awareness through periodic publication. – Engage in community-based, educational discussions. – Promote the preservation of access to established flight zones and advocate for advancement in the pursuit of human flight. By providing a platform for open communication HFA is able to promote human flight and spread knowledge to everyone, including low-income public sectors. – The public and practitioners can join the association online. – The web page will contain information about HFA. – In joining the association member will receive benefits consisting of rescue insurance and a subscription to the periodic publication. – As an association with members HFA will be established as a user group. The pursuit of human flight is growing and practitioners often cite that there is a lack of organization and funding that inhibits advancement. Human flight advocates recognize that an organized source of knowledge is unavailable to the practitioner or the public. HFA will spread knowledge as well as provide funding and organization in order to advance the pursuit of human flight. – Promotes quality advancement in the art of human flight. – Teaches standards of best practice in the pursuit of human flight. – Shares inspiration and knowledge to the community. – Establishs the user group. In the first 12 months of operation, HFA projects to acquire 10 members per month at 75$ per person, which is a total of 9,000$ in membership fees for the first year. In addition to membership fee’s, HFA will collect donations from private donors projected to total half of the funds collected by membership fee’s, 4,500$. Thats a total of 13,500$ in the first year. All funds will be deposited into the Human Flight Association Foundation and be for the direct use of achieving the goals of HFA. – Individuals will consist of the private members. – Commercial Companies will have the opportunity to contribute to the organization via private donations. – Private Investors can also contribute via private donations. -Technology Advancement– Founds dedicated to the development of new technology related to human flight. (new suits, wings, parachutes). -Inspiration Advancements– Founds dedicated to the exploration of new human flight ideas. -Positive Impresion Advancement– Founds dedicated to opening up illegal locations for human flight. -Strengthen Association. This would include organization establishment (Logo), promotional material development and a marketing strategy. -Design Web Site. Develop a beautiful website, with user friendly interface. This web page will allow for entities to easily access HFA information, allow for registration of members and donations, view the latest news in human flight, and apply for support of human flight advancement. -Risk Mitigation and Best Practice Development. Work with developing risk management and establishing solutions to issues by institutionalizing procedures of best practice. -Quality Assurance. Allow members the opportunity to give feedback to the association in order to establish a better organization. -Business Management. Deploy tools to track organization growth. Review and optimize transaction process for convenience and member satisfaction. -Web Management. Maintain content that strengths HFA’s mission and the community. -Marketing. Deploy educational content to outreach possible members and contributors. -Members. Managing communications with existing members and contributors. -Administration. Managing HFA office and associates. -Events. Provide in-house events to raise awareness and attend existing events as a guest to spread awareness.